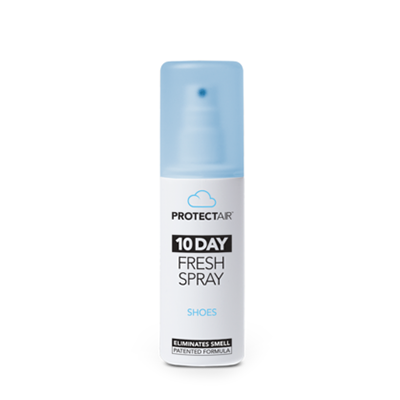 ProtectAir The 10 Day Fresh Spray offers the most effective long-term protection against bacteria & odour. This spray is the only product on the market that has been proven to work for up to 10 days. HOW DOES THIS SPRAY PROTECT ME? The spray helps with the treatment and prevention of athlete’s foot and nail fungus and is the only product in the market with CE and biocide registration and independently verified test results. Other disinfectants may kill bacteria but will not protect against reinfection. ProtectAir leaves an invisible coating on the surface, that reactivates on touch. Ensuring hygiene for up to 10 days. ProtectAir 10 Day Fresh Spray can be used on sports equipment, shoes, helmets, bags, prosthesis, orthesis and more.